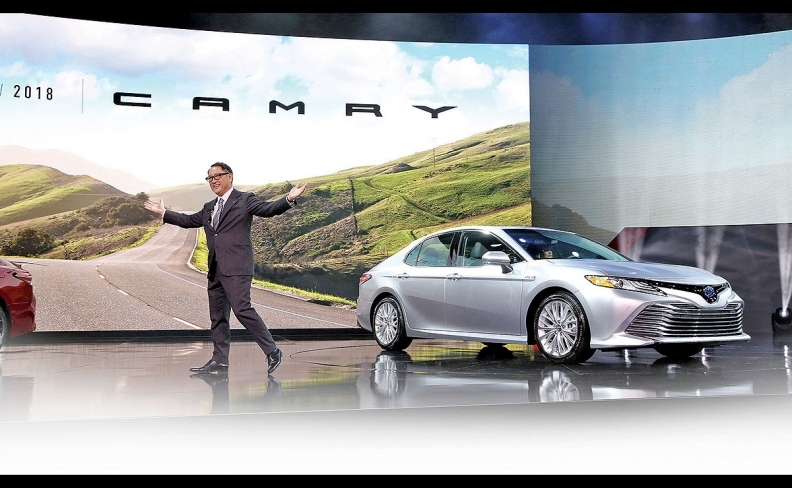 Akio Toyoda introduced the 2018 Toyota Camry at the Detroit auto show. TOKYO -- Toyota said the infotainment system of its revamped Camry sedan to be sold in the U.S. will run on a Linux-based, open-source technology platform as it tries to keep up with tech firms in developing software for cars. With the Automotive Grade Linux (AGL) system in a mainstay model, Toyota aims to have the flexibility to customize its software, while it would also keep user data that could otherwise be captured by CarPlay from Apple or Android Auto from Google -- applications that enable users to access smartphone data through vehicle infotainment systems. Toyota is among 10 global automakers working with suppliers and technology companies to jointly build AGL, a basic, open-source platform for vehicle applications which automakers can customize, eliminating the need to code systems from the ground up for each vehicle model. Developing the platform in collaboration with Mazda, Suzuki, Daimler and others will reduce development time and costs, Toyota said, and create an industry standard platform to operate in-vehicle features including music and navigation applications. "It comes down to an automaker wanting to customize their operating platform to their liking and not having a third party dictating what the applications are going to be for the vehicle," he said.